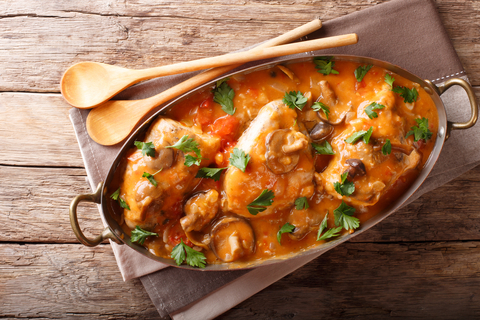 Chicken Chasseur is on our menu today. Hi, today we are going to share this tantalizing classic french dish with all our fellow home chefs here on the East coast of Africa and around this great world of ours. 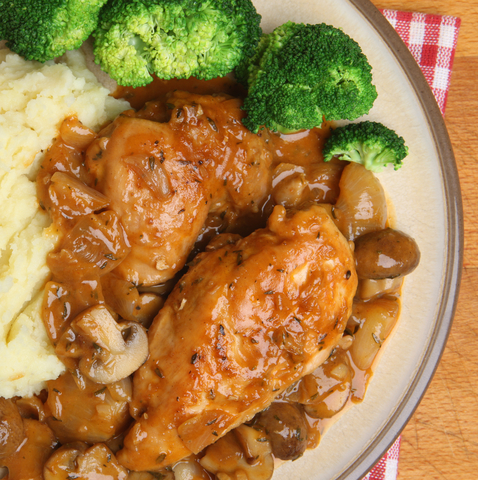 Firstly a very quick overview: This French recipe is prepared using sautéed chicken that is cooked crisp and a chasseur sauce (sometimes called Hunters sauce ) consisting of tomatoes, mushrooms, onions, white wine, brandy and tarragon. 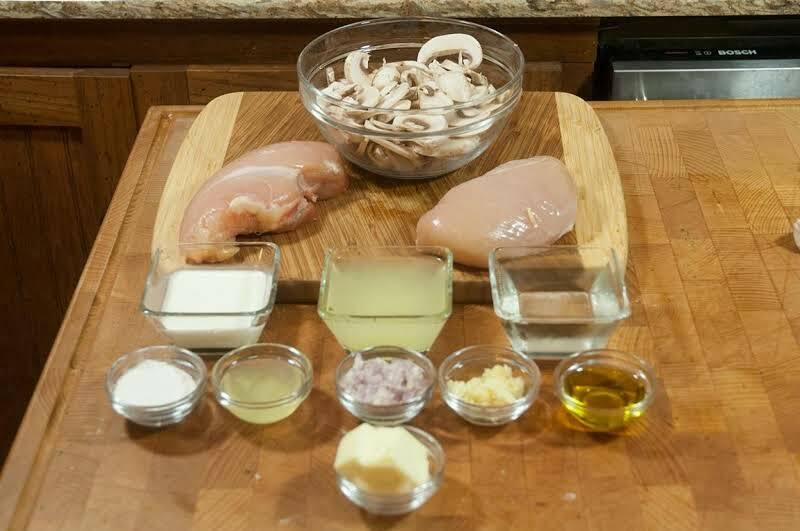 The sauce for hunter's chicken is typically prepared and thickened by the process of reduction. 4 - 6 pieces of chicken thighs. 6 shallots or pickling onions peeled and then halved. 45ml (3 Tbsp. ) cake flour. 2 med size bay leaves. Preheat your oven to 180°C (350°F}. In a frying pan fry your bacon until brown, transfer to the prepared oven dish. Transfer Chicken to oven dish. Again in the same frying pan brown the shallots and mushrooms ,transfer to the oven dish. Mix the chicken stock, wine and tomato paste and bring to the boil. Mix the remaining butter with the flour and stir knobs of the mixture into the liquid. Whisk while heating until sauce thickens slightly and comes to the boil. Season with salt and black pepper and add the bay leaves. Taking care not to burn yourself pour sauce over the chicken and combine. Cover and bake for app.1½ hours or until chicken is done. 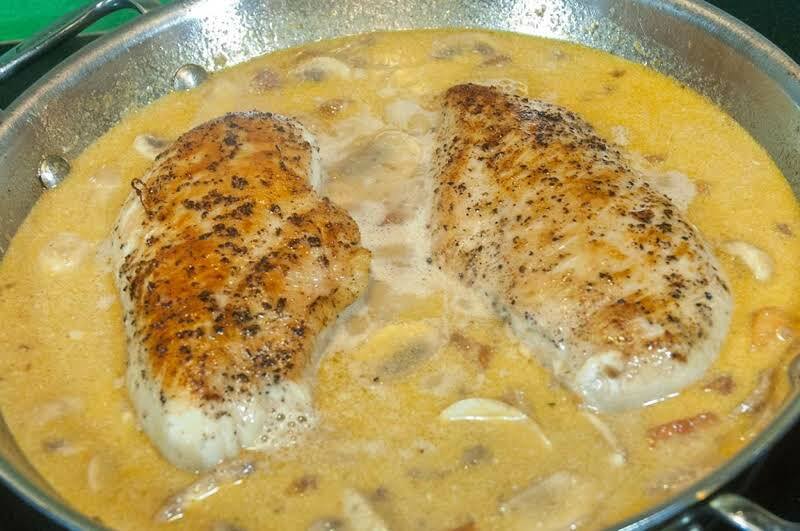 Great time now to put on your oven gloves and again taking care, remove the Chicken Chasseur, stop..............take a moment and enjoy the fragrance of the dish you have just completed. Below are a few plating ideas. Serve with Creamy mash potatoes (Banting dieters can use mash cauliflower or mash sweet potatoes). And of course lets not forget a side dish of fresh French salad. Garlic butter French bread roll. last but not least a glass of either a light-bodied Merlot., Coq-au-vin: Red Burgundy, Pinot Noir. Now all that's left to do is summons the family to the dinning table.